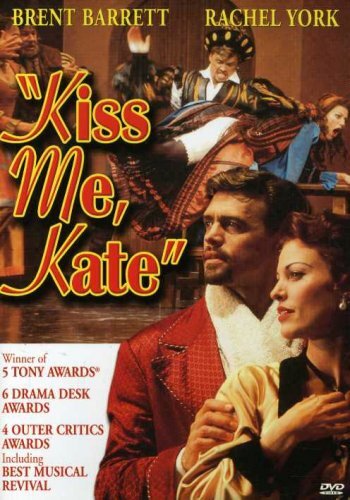 Nearly 18 months after Mandelbaum’s assessment the first Broadway revival of Kiss Me, Kate opened at the Martin Beck theater as the first major hit of the season, going on to win Tonys for Revival, Director (Michael Blakemore), Actor (Brian Stokes Mitchell), Costumes and Orchestrations. And the book did feature some noticeable revision, from an un-credited John Guare. The New York Times ran a fascinating article during the revival’s run discussing the rewrite issues that halted previous productions: in short, the couple left in charge of the Spewack’s estate (correctly) intended to preserve the legacy of the original librettists and would not agree to any production that sought to either radically alter the text or credit a new writer. John Guare succeeding in procuring a green light by declining a book credit and assuring the executors that he wanted to “invigorate” rather “rethink” the piece. And, as seen on the DVD, the Spewack’s work remained largely intact with most of the adjustments additions (and largely unnecessary at that). The most significant adjustment was transforming Harrison Howell from a Senator whose chief fault is being boring to a bombastic General who is, in addition to being boring, loud and controlling. The Act 2 scene in which Fred convinces Lilli that life with Harrison is unsuitable now mirrors the “kill her with kindness” scene from Shrew with Harrison objecting to Lilli’s stylish new hat (just as Petruchio deems as unworthy a hat that Kate receives). Fred is reduced to color commentary, no longer the mastermind of the scene. “From this Moment On”, added to the 1953 movie, is added here as a duet for Harrison and Lilli (of unclear intent). A reworked “Another Opening, Another Show” felt a lot like the opening to Follies, with various stars entering and looking around the theater in wistful nostalgia. I found this opening–spans an unspecified length of time (minutes, hours, days, weeks? )–more confusing than enlightening and lacking in the excitement (not to mention the melody) the number is meant to convey. Other smaller revisions to both script and score are sprinkled throughout the production, shaping and focusing every specific moment of nuance and character development already present in the script. When they production wants to play a line of “Why Can’t You Behave” as being particularly tender, that moment is is slowed down with a few extra strings added to the arrangement to telegraph “ROMANCE”. The result is a detailed production that pries every bit of humor and pathos from the script and score, but does so with apparent effort and labor. And, for all the talk of clarifying the script, I found the original text–as heard on the BBC concert broadcast–clearer in its story telling with better pacing. I don’t mean to imply that this production is a poor showing. The musical arrangements–if at times heavy handed–are lovely with the new orchestrations adding a wide variety of musical textures and flavors (a Renaissance feel permeates the Shrew numbers, a slinky, jazzy treatment for “Too Darn Hot”). Much of the comic business is inspired; Kathleen Marshall’s dance numbers–if consistently overlong–always serve the story; and the backstage world was thoroughly and richly conceived and executed. If the DVD lacks the spark and spontaneity ecstatic reviewers saw at the Martin Beck with Marin Mazzie and Brian Stokes Mitchell, it is a fine document of a beautiful production. Rachel York is an excellent Lilli/Kate and owns the role like she created it. As Fred/Petruchio, Brent Barrett seems more in his predecessor’s shadow, but his singing is glorious with his reprise of “So In Love” the musical highlight.